Have a question? Before you make that post, see if its been answered here! Clicking on any question in the following bulleted list will automatically take you to the corresponding answer in this thread. Why was my thread topic deleted/moved somewhere else? What do I do if I've been banned in the game or suspect someone of cheating? What do I do if I've been banned from the forums? 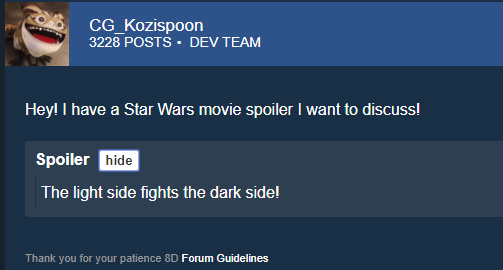 How do I hide parts of my post under a ' clickable spoiler' button? How do I add images or gifs to my post? How do I tag a dev or moderator in my post? How do I send a direct message (DM) to someone on the forums? How do I add people to a direct message conversation? How do I leave a direct message conversation? How do I upload a forum avatar? When does the monthly Event Calendar get released? The New Player Index is always a great place to start. Be sure to check out the Guides Index next. As a rule content is never deleted, but nudged to the proper category! Not only has the Forum gotten busier with the addition of new Mods (See Mod Listing here), but they are hard at work! Moving forward, we hope General stays Generally on topic with current events,and featured content that will be moved to their proper categories later, but in addition work is being done to ensure the entire forums receive the proper engagement in order to filter feedback. To report your bugs and issues to us, please do not post them on this forum. Please visit Answers HQ and fill out the required fields to better detail and report your findings to our team. If you want to report a potential cheater, please send a forum Direct Message (DM) to @CG_LucifersDaddy with details on why you think someone is cheating, your ally code and the name of the suspected cheater. To appeal an in-game ban, please contact @CG_LucifersDaddy in a forum Direct Message (DM). First and foremost DO NOT make a new forum account! Please note temporary bans are not subject to appeal. If you feel that you have been long-termed banned incorrectly, please contact us at help.ea.com or submit an email to [email protected]. These types of threads are open for any forum member to reply to. A necro thread is a topic that was posted a long time ago that's been brought back to recent discussion by a recent reply. Per the Forum Guidelines, necro-ing threads is not allowed, so please be mindful of the dates on threads you decide to reply to! At the bottom of each post, you can see three words : Flag, Quote and Like. By clicking "Quote", you automatically include the message you want to quote in the field reserved for typing your answer. BBCode to include the quoted message in the right format is also automatically added. If needed, you can then delete the parts of the message you don't want to quote, or split the message in several parts by simply copying/pasting the BBCode if you wish to answer separately to different parts. You may also select several messages to quote if you answer to multiple messages in the same post. Hit that "Like" button at the bottom of any post. Don't be afraid to spread the love, if someone makes a good point, throw them a like! 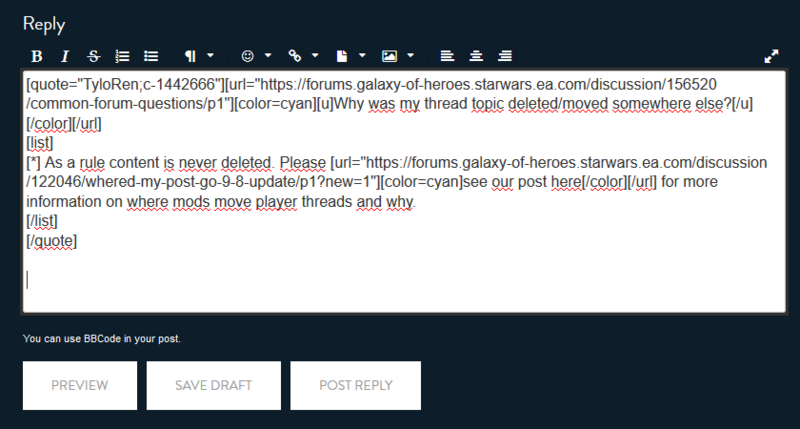 How do I tag a Dev or Moderator to my post? Like anyone else : simply use @ followed immediately by the Dev or Moderator's Forum name. How do I direct message someone on the forums? In the top right, to the left of their profile picture, click "Message"
When in a direct message, on the right hand side there is a button "Leave Message" that will take you out of the conversation. Navigate to a user profile. Click the Person icon at the top right of their profile. Click Ignore List in the menu on the right. Click Unignore next to desired username. Typically, new event calendars are posted near the end of the previous month. So for example, February's event calendar will be posted at the end of January.